Snooper Evolution speed camera detector is packed full of valuable safety features. Using the latest GPS technology the Snooper Evolution features a European database that will locate all types of fixed Speed Cameras. The Snooper Evolution speed cameras detector also features auto-ranging and smart mute. Snooper Evolution has been discontinued. Accessories are still available for your Snooper Evolution click here. 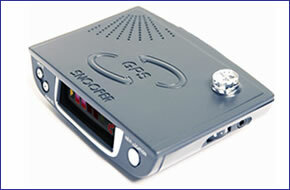 The Snooper Evolution speed camera detector will detect all types of 'fixed' cameras using GPS. The Snooper Evolution provides bright, clear and safe warnings with loud adjustable Voice Alerts and a LED dot matrix text display. As you approach the danger zone, the Snooper Evolution speed camera detector will tell you the exact camera you are approaching, begin to emit a loud audible bleep and will confirm the Speed Limit of that stretch of road. As you get closer to the zone the bleeping will quicken and the text display will accurately count down your distance to it until you have passed the danger. Once you have passed the camera or accident hotspot the display will revert to normal, ready to warn you of the next impending hazard! The Snooper Evolution speed camera detector includes Auto-Ranging alerts. The Auto-Ranging feature is used so that you no longer have to set the detection range as the Snooper Evolution automatically calculates the distance required depending on the speed limit. Using AURA (trademark) Software Snooper manages a database of the co-ordinates of all Speed Cameras plus many officially designated Accident Black spots and High Risk Zones across Europe. This database can then be downloaded on a regular basis via a PC so that you always have the latest information with you. One of the most significant and important benefits of this technology is that each co-ordinate can be 'tagged' with additional information such as the Speed Limit of the stretch of road where the Speed Camera is situated. As a result you can be made aware, not only of potentially dangerous stretches of road but of the current Speed Limit at the same time. The Snooper Evolution like all Snooper speed camera detectors, gets it speed camera data from the Snooper AURA speed camera database. The database provides advanced warnings to both fixed and mobile speed camera locations across the UK, Europe and in a growing number of other countries across the World. The database is constantly updated with the latest locations. Click here to read more about the AURA speed trap database. Mount the Snooper Evolution device in a suitable position on the dashboard or windscreen and connect it to the vehicles cigarette lighter socket with the power cable provided, then switch it on. Snooper uses AURA. AURA consists of a dedicated team whose sole purpose is to research and manage a database of cameras and other points of interest. Simply connect the Snooper Evolution to a compatible PC and this concise database can be downloaded. To download and successfully update the Snooper Evolutions GPS speed camera database, you will need a PC running either Windows XP (32-Bit), Windows Vista (32-Bit), Windows 7 (32-Bit) with an internet connection. Please note: the Evolution, as with all Snooper products, is not Apple MAC compatible. Want to add accessories to your Evolution? We sell a vast selection of genuine Snooper parts and accessories.